Hello Jet Lag, My Old Friend… – Watts up, world? The second day is always when the time difference and the overall exhaustion from travel hits me. Luckily, it wasn’t as bad as it usually gets, thanks to an hour and a half bus ride from Kraków to Oświęcim for the next leg of our trip. As we waited for our bus on this drizzly morning, I had a minor accomplishment that made me feel invincible: I bought a bottle of water from a stand without using any English! Granted, my conversation with the woman was short, but it was effective and 100% in Polish, so I’m calling that a win for me. Once we arrived in Oświęcim, I was taken aback for a second as I looked around out of the windows of our bus. Our bus dropped us off at Auschwitz. Our hotel, Olecki Hotel, is directly across the street from Auschwitz. I knew that we were staying close to the concentration camp, but I had never expected that it would be right out the front door. 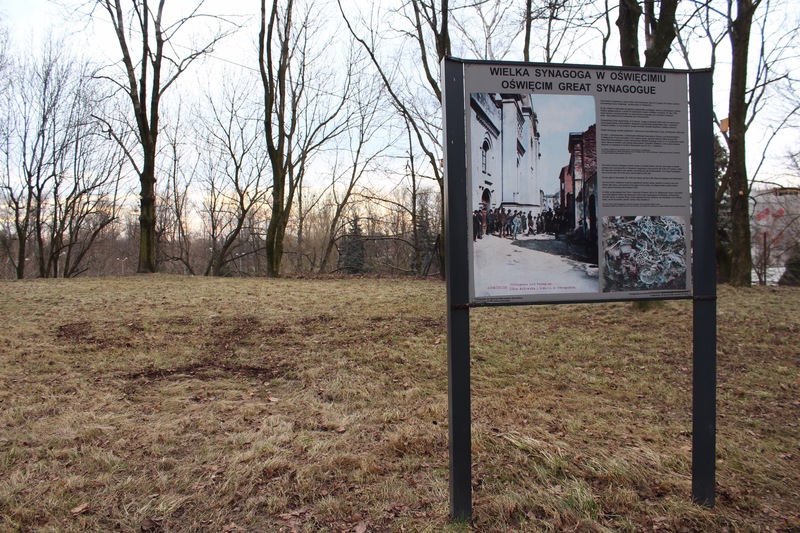 What I was most interested in learning during this trip is how Oświęcim residents handle living with one of the most tragic locations in their backyards. After seeing several of the buildings and being face-to-face with it, I can only imagine the stories we will hear over the next three days from those in the area. Even if you know you are going there, the initial reality of seeing any parts of Auschwitz in person may stop you in your tracks. At least, it did for me. After we had settled into our hotel, our lovely guide for the week, Anja, had lunch ordered for us at the hotel so we could continue on with our afternoon. Bus ride naps make for some very hungry people!! 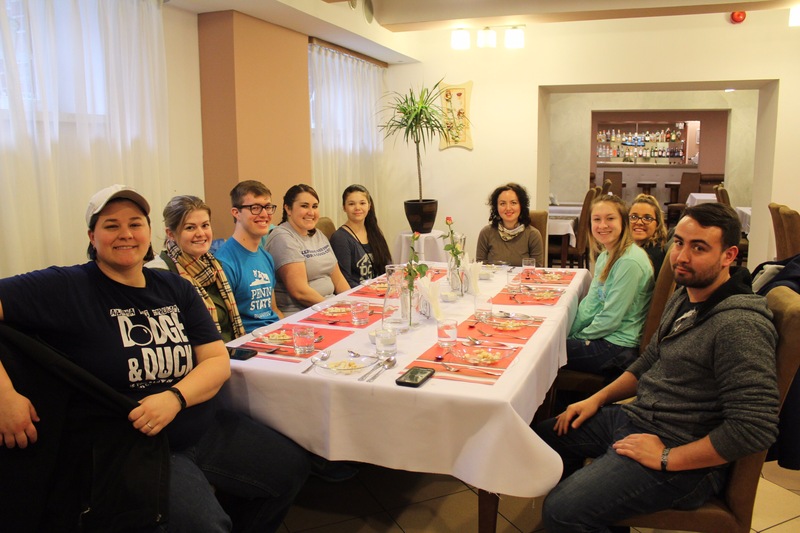 Once we filled our stomachs with Anja’s picks, we made our way out into the town. 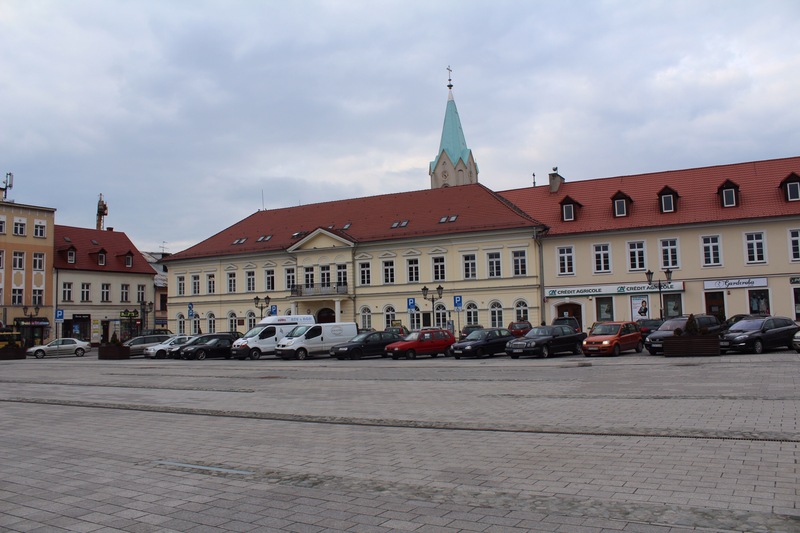 We walked through the Old Town Square in Oświęcim, where we saw traditional architectural styles of the Third Reich. (If you haven’t been able to tell yet, I’m obsessed with architecture!!) Their traditional buildings have red roofs that have windows. For the little bit of walking we have done around Oświęcim, it is easy to pick out which buildings were a part of the Third Reich. We then headed to the Jewish Center and Synagogue where we were given a tour from Max, a volunteer at the museum from Austria. (Side note: Austrians have awesome accents!!) While we were there, we were able to see some of the artifacts found at the site of the Great Synagogue that had been destroyed. The patch of land where it had stood is closed to the museum and synagogue. The site of the Great Synagogue. It was able to hold up to 2,000 people. It was destroyed by the Nazis in 1939. We also had a unique opportunity at the synagogue to see the Torah scrolls that are kept there. 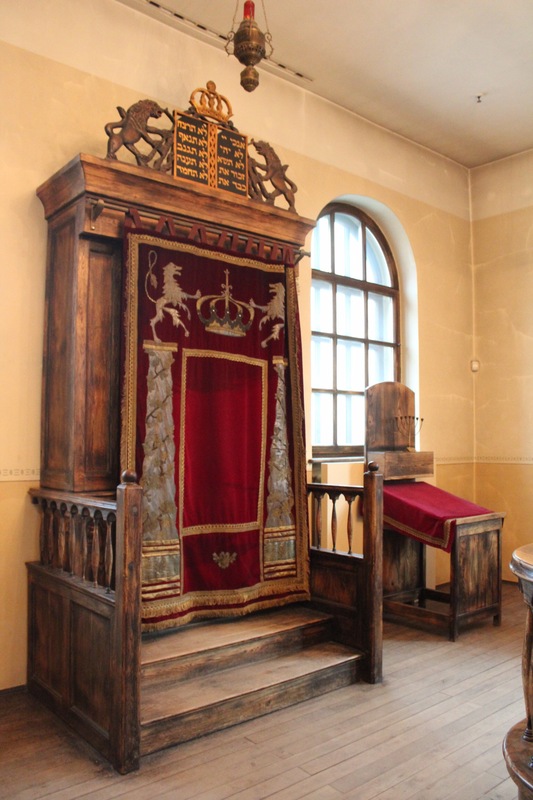 Normally, only a rabbi can open the Torah ark (where the scrolls are kept) but the museum has been given permission and approval from several rabbis to open the ark for educational purposes. The scrolls were not opened, but we did have the opportunity to see where they are kept. Of the two scrolls, one was donated from Cincinnati and the other was donated from New York. At the end of the tour, we left through an attached coffee shop, called Cafe Bergson. Along with their wonderfully smelling coffee, they sold books and small assorted gifts that helped to fund the museum. 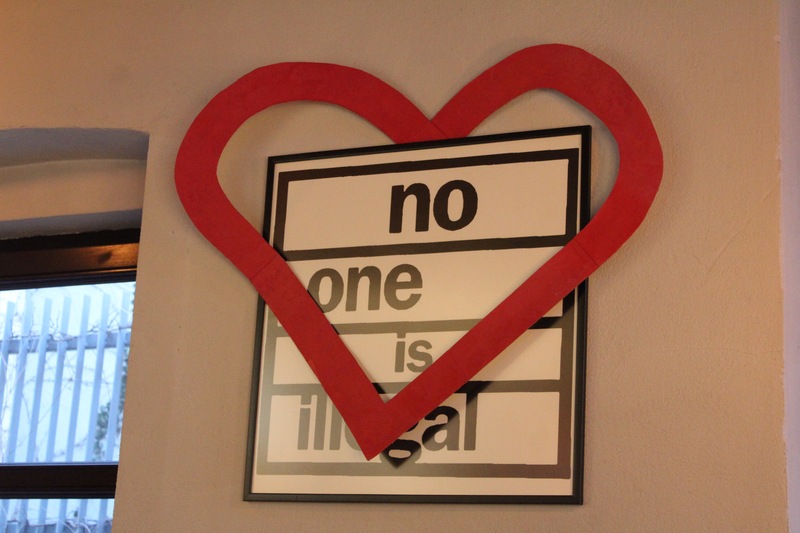 On the wall of the coffee shop, a sign was hung that I believe everyone needed to see. I believe that the message of the sign stands the test of time, from the past, the present, and to the future. Tomorrow we start touring Auschwitz in the morning and head to the CDiM to meet with Father Manfred Deselaers in the afternoon.